At present, the way in which the diseases are treated and prevented is mainly through modern approaches and newer drugs. Although it is beneficial in many ways, these approaches were found to cause high rates of mortality and morbidity due to its adverse effects., Adverse drug reaction (ADR) may be defined as noxious change or injury in humans caused by administration of a drug, usually at normal doses or overdoses which require intervention by decreasing the dose or treatment. Pharmacovigilance is the field concerned with the study of ADRs. Pharmacovigilance, also known as drug safety, is the study of science and activity related to collection, assessment, detection, and knowledge about the adverse effects of a drug or other drug-related problems and also the prevention of these adverse effects. The adverse events experienced by the patients were continuously detected, monitored, and reported to the pharmacovigilance by the health-care professionals., In India, since the inception in 1986, the practice of detection, monitoring, and reporting the adverse events has significantly grown. More than 94 countries throughout the world were technically supported by the WHO and UMC located in Sweden. In India, 2004, with the help from the World Bank, the National Pharmacovigilance Program was established, but since July 2010, the program was remodeled as Pharmacovigilance Program of India and was taken over by the Ministry of Health and Family Welfare. The long-term goal of Indian Pharmacovigilance Program to establish a “Centre of Excellence” will be achieved through collaboration with the WHO and UMC. Under this program, besides investigation of modern medicine, the Ministry of Health and Family Welfare also investigated other traditional systems of medicine such as Ayurveda, Unani, and Siddha. Medical colleges, central institutes, autonomous institutes, and public and corporate hospitals were selected as ADR-monitoring centers. In addition, in the curriculum of medical undergraduate and postgraduate (PG) pharmacology, the pharmacovigilance program has been added in many medical colleges. It has been made mandatory by the Medical Council of India that each medical college should have a functioning pharmacovigilance. Based on several studies conducted in different countries, it can be found that the health-care professionals lacked adequate knowledge, attitude, and practice on monitoring, detection, and reporting of adverse events of a drug. For example, the study conducted by Rehan et al. revealed that only 82% of the health-care professionals were aware about the existing pharmacovigilance program. This study aimed to evaluate the knowledge and attitude of doctors and medical students in a research institute about ADR reporting and to suggest possible ways of improving ADR reporting. This was a cross-sectional, self-structured, questionnaire-based survey which was conducted in a tertiary care research leprosy hospital. Study consent was obtained from the department. It was conducted on doctors and students visiting our institute (MBBS, internships [CLTRI], and possibly various departments of clinical, paraclinical, and preclinical PGs as well as faculties). The study instrument was a predesigned 25-item questionnaire which was structured to obtain data on the knowledge of ADR reporting, attitude toward the reporting, and the factors in practice that could hinder the reporting among the health-care professionals. The questionnaire was prevalidated by a pharmacologist and public health consultant and by few doctors for their ease of involvement and answering. Suggestions on the possible ways to improve the ADR reporting were also made and mentioned. The correct answer was given a score of “1” and the wrong answer was given “0,” with the maximum possible score of “10” for question-wise knowledge among groups. All were consented and briefed about the purpose of the study. All the study participants were given 15 min to fill the questionnaires. Any clarification needed in understanding the questionnaires and additional time to filled form was provided. Out of the 55 questionnaires, all were adequately filled and included for the analysis. Hence, 55 questionnaires were considered for analysis, giving a response rate of 100%. Of the respondents, 20% were medical students who entered the internship residency, 41.81% were MD graduates, 20% were MBBS graduates, and 18.18% were PGs in various medical disciplines [Figure 1]. 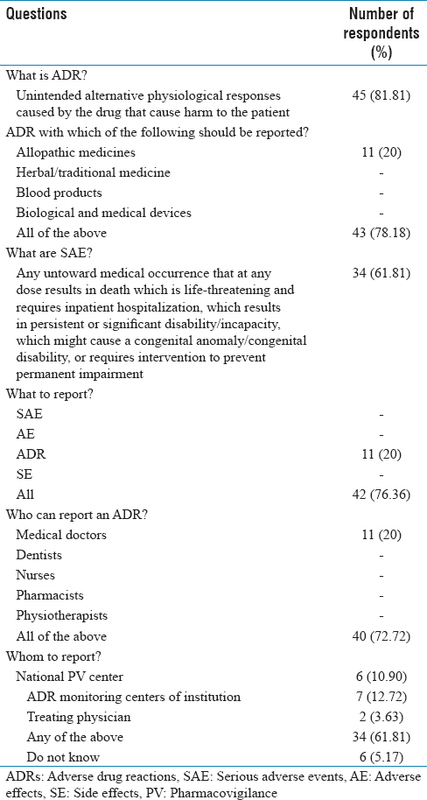 [Table 1] shows that 81.81% of the respondents who participated in the study know about what is an ADR, 61.8% of the respondents were aware about the meaning of serious adverse events, 76.36% of the respondents were aware about all the events which should be reported, 72.72% of the respondents were aware about all professionals who can report an ADR, 78.18% were aware about all the products with which adverse reactions should be reported, and 61.81% of the respondents were aware about the various reporting places. In all, 81.81% of the respondents were aware about the term pharmacovigilance and 49.09% were aware of the pharmacovigilance program in India, 5.45% were aware of vigilance center in PGIMER, and 25.45% were aware of the National Coordinating Centre for Vigilance in India. Nearly 55% of the respondents were aware about ADR monitoring and reporting, whereas 98.18% opined that serious ADR with any medicine should be reported. Of the respondents, 7.27% believed that ADRs should be reported only for newly marketed agents. Although 54.54% of the respondents observed an ADR, only 16.36% reported it. Only 10.90% of the respondents reported that ADR reporting is necessary and is needed to stratify drug-causing ADR. Almost 80% of the respondents accepted ADR reporting as their professional commitment [Table 2]. [Table 3] shows the general attitude of the respondents about ADR reporting: the preferred ADR reporting system should be mandatory (69.09%), voluntary (20%), and need base (5.45%) and the preferred mode to report should be phone (9.09%), dropbox (23.63%), E-mail (23.63%), and personal visit (38.18%). Almost 41.81% of the respondents needed a complete feedback after the ADR reporting, 23.63% of the respondents opted increasing awareness about pharmacovigilance through training/projects/continuing medical education (CMEs), as the factor encouraging for ADR reporting, and 38.18% opted lack of knowledge about the process of reporting as the factor discouraging ADR reporting. [Table 4] shows that only 60% of the respondents were aware about the complete procedure to be followed whenever an ADR is suspected. [Table 5] shows the average knowledge among the four groups of health-care professionals. Among these, MBBS were 69.99% followed by PG 66%, CRRI 58.17% and, finally, the MD were 52.60%. 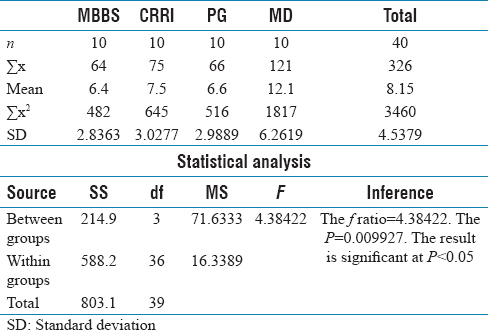 [Table 6] shows the mean score among the four groups showing significant statistics among them. ADR reporting is an essential component of pharmacovigilance and is considered to be an important signal for the safety surveillance of marketed drugs. The most important tool for detecting new safety issues related to drugs is the spontaneous ADR reporting. Previously, many studies have evaluated the knowledge of health-care professionals about pharmacovigilance and their functions. However, there were only a few studies conducted exclusively on resident doctors. Response rate reported in our study was 100%. Response rates of 77.2% and 93.33% were reported in other studies carried out on resident doctors. The reason for the highest response rate in our study is that the questionnaire was given in places of the outpatient department (OPD) and in classrooms and the completed forms were collected back within 20 min of distribution. Although 81.81% of the respondents were aware of pharmacovigilance, only 50.90% were aware about the process of ADR reporting and only 16.36% had ever reported an ADR to any of the ADR-monitoring centers. Similar results were reported from many other studies from India,,, and also abroad.,, However, studies from developed economies such as the UK and the USA have reported a higher rate of ADR reporting and higher awareness about pharmacovigilance among health-care professionals. Furthermore, a study from India about pharmacovigilance among medical practitioners has reported encouraging findings regarding perceptions and attitudes. This difference suggests that lesser awareness may be due to less emphasis being given to this program and inadequate measures for raising awareness about the same. 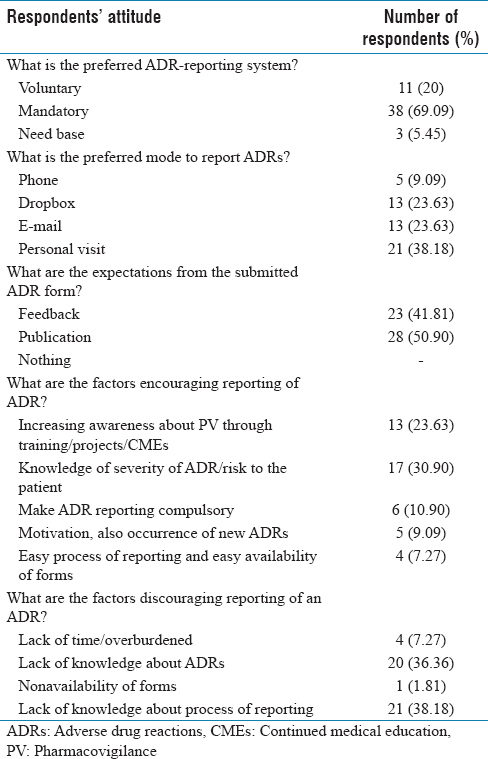 This also reflects the view of 23.63% of respondents in this study who feel that reporting of ADR can be improved by imparting knowledge about pharmacovigilance through workshops, CMEs, or various other training programs. Although the fact that medical professionals such as doctors and dentists can report an ADR was well known, the awareness that even nurses, pharmacists, and physiotherapists can do so is very well documented by the responses given by the majority of the respondents in this study. It is clearly found that involvement of paramedical staff, who is closely observing the patients for a longer duration than the doctors, is essential in spontaneous reporting of ADR which will help in improving the reporting rates. Hence, the training of the paramedical staff about pharmacovigilance is also important along with training of doctors. In some studies, similar results were reported,, while the role of paramedical staff was well known as per other studies. The majority of the respondent' s opinions (78.18%) were that ADR reporting has to be done for all allopathic medicines, herbal/traditional medicine, blood products, and biological and medical devices, while around 20% of the respondents opinioned for only allopathic and herbal/traditional medicines. This again is a matter of concern because many patients are with the habit of taking medicines from different systems of health care such as Ayurveda, homeopathy, and Unani although none of them are free from ADRs. Hence, it is necessary to make health-care professionals aware about the fact that ADRs due to any medicine from any system of health care have to be reported. Nearly 92.72% of the respondents believed that ADRs should not be reported only for new drugs but also for all other drugs. Although this is a positive finding, it is surprising considering the lack of general awareness about pharmacovigilance among the respondents. On the contrary, another study involving resident doctors has reported that 93% of the doctors were more inclined to report an ADR if it is with a new drug and 91.37% of the respondents opined that only serious ADRs should be reported with any drug. This widely prevalent misconception needs to be addressed and measures should be taken to rectify the same. In this study, 80% of the respondents felt that ADR reporting is a professional commitment, an encouraging fact that needs to be propagated further. Another interesting solution to improve ADR reporting was to make ADR reporting compulsory as suggested by 100% of the respondents. This if implemented can definitely help in improving the reporting rates, though this does not seem to be practically feasible. 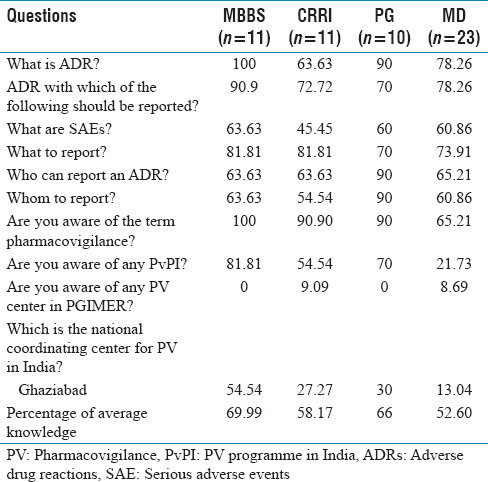 Apart from various reasons cited by respondents for inadequate ADR reporting in this study and in other studies, it also appears that undergraduate training about pharmacovigilance and awareness about the risks associated with medicine use may be either deficient or unsatisfactory to prepare the prospective doctors for the job of ADR monitoring and reporting in their future career. Hence, adequate consideration needs to be given to the subject of ADRs in the clinical pharmacology and therapeutics curricula in undergraduate medical education. This can be helpful in sensitizing the medical students about this important issue. Finally to conclude, undertaking educational programs directed at increasing awareness about pharmacovigilance will undoubtedly be helpful in improving the status of ADR reporting and helps in keeping a check over the possible adverse outcomes for the drugs marketed. In addition, other measures such as making ADR reporting guidelines available in the form of booklets and displaying posters with placing a rack for keeping ADR form with other important requirement form in the Intensive Care Unit, OPD, and the ward in hospitals will serve as a constant reminder for the resident for regular activities which can also play a useful role. Badyal DK, Kanish B, Gulrez G. Causality assessment and pattern of adverse drug reactions in a tertiary care hospital. Int J Basic Clin Pharmacol 2018;7:210-4. Kilbridge PM, Classen DC. Automated surveillance for adverse events in hospitalized patients: Back to the future. Qual Saf Health Care 2006;15:148-9. Edwards I, Olsson S. WHO: Global monitoring. In: Mann RD, Andrew E, editors. Pharmacovigilance. Chichester: John Wiley & Sons; 2002. p. 169-82. Ahmad SR. Adverse drug event monitoring at the food and drug administration. J Gen Intern Med 2003;18:57-60. Amale PN, Deshpande SA, Nakhate YD, Arsod NA. Pharmacovigilance process in India: An overview. J Pharmacovigil 2018;6:259. Gupta YK. Ensuring patient safety-launching the new pharmacovigilance programme of India. Pharmatimes 2010;42:21-6. Central Drugs Standard Control Organization. Long Term Objective of Pharmacovigilance Programme in India. Available from: http://www.cdsco.nic.in/pharmacovigilance_intro.htm. [Last accessed on 2018 Jul 11]. Pimpalkhute SA, Jaiswal KM, Sontakke SD, Bajait CS, Gaikwad A. Evaluation of awareness about pharmacovigilance and adverse drug reaction monitoring in resident doctors of a tertiary care teaching hospital. Indian J Med Sci 2012;66:55-61. Desai CK, Iyer G, Panchal J, Shah S, Dikshit RK. 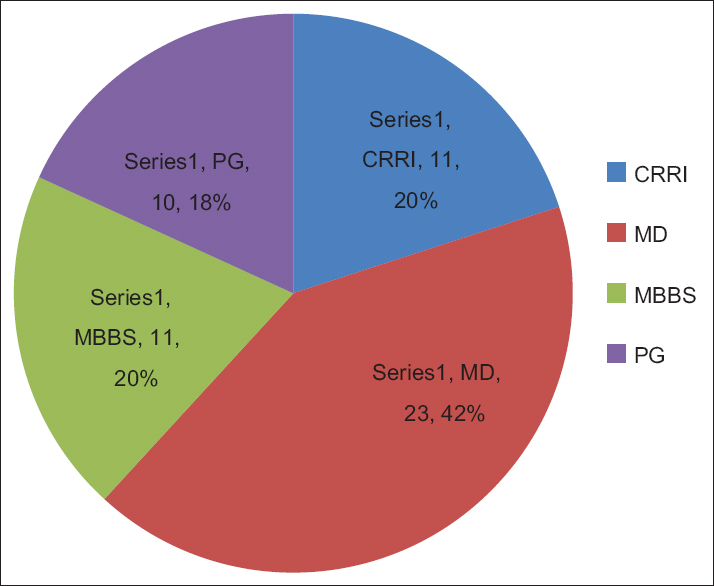 An evaluation of knowledge, attitude, and practice of adverse drug reaction reporting among prescribers at a tertiary care hospital. Perspect Clin Res 2011;2:129-36. Madhan R, Parthasarathi G. Adverse drug reactions reporting: Attitudes and perceptions of medical practitioners. Asian J Pharm Clin Res 2009;2:10-4. Oshikoya KA, Awobusuyi JO. Perceptions of doctors to adverse drug reaction reporting in a teaching hospital in Lagos, Nigeria. BMC Clin Pharmacol 2009;9:14. Lopez-Gonzalez E, Herdeiro MT, Figueiras A. Determinants of under-reporting of adverse drug reactions: A systematic review. Drug Saf 2009;32:19-31. Hazell L, Shakir SA. Under-reporting of adverse drug reactions: A systematic review. Drug Saf 2006;29:385-96. Mc lernon DJ, Bond CM, Hannaford PC, Watson MC, Lee AJ, Hazell L, et al. Adverse drug reaction reporting in the UK: A retrospective observational comparison of yellow card reports submitted by patients and healthcare professionals. Drug Saf 2010;33:775-88. Sekhon MS, Gupta AK, Sharma N. Evaluation of the knowledge, attitude and the practice of pharmacovigilance among the interns and doctors in a tertiary level care teaching hospital in Northern India. Int J Basic Clin Pharmacol 2016;5:1068-74. Vallano A, Cereza G, Pedròs C, Agustí A, Danés I, Aguilera C, et al. Obstacles and solutions for spontaneous reporting of adverse drug reactions in the hospital. Br J Clin Pharmacol 2005;60:653-8. Bäckström M, Mjörndal T, Dahlqvist R, Nordkvist-Olsson T. Attitudes to reporting adverse drug reactions in Northern Sweden. Eur J Clin Pharmacol 2000;56:729-32.